I subscribed to tinyStudio as soon as it was available and was eager to read my first issue. I really enjoyed the Big Book of Fibery Rainbows and have followed the work of Suzy Brown for awhile. Suzy is joined by Evanita Montalvo and Arlene Thayer in this creative adventure..
tinyStudio is not a spinning magazine or I should say it’s not just a spinning magazine. It uses spinning as the base for a creative mindfulness practice and for adding creativity into your life. There are layers to tinyStudio, if you aren’t interested in creative mindfulness there is good and interesting crafting and making information too. Suzy loves and lives a minimalist creative life. She talks a lot about paring down without restricting, having just what you need, and how it makes her more creative. You know how sometimes you say a person has a beautiful soul? Well I would say that about this magazine. The photos are stunning clear, and full of texture. The articles are varied, from what you expect from a spinning magazine, yarn and tool how-tos, reviews, a breed study, and articles on dyeing. What makes this magazine unique are the other things that Suzy has layered in. Things like the opening article about how mindfulness and working within her environment led a spinner to create art from grass. There is a recipe for tea, and articles on honoring imperfection, finding your flow and how letting go is the path to mastery. I found myself scanning the articles I might find in other magazines and really digging in and sometimes rereading bits of the articles that are the true heart of the magazine. I’m looking forward to my second issue. There is a video library for subscribers with new videos for each issue. I haven’t visited it yet. $4.95, per month, charged monthly. As the year winds down I'm feeling a little stuck. Stuck in the way where I feel like I'm marching in place; I'm feeling creatively run down. I've had a busy year, a wonderful year, but I need to shift something for this last little bit. I want to really recharge the creative part of me and get ready for 2019, which is already shaping up to be different than I thought it would. I've decided to do something creative every day in December, a little something that doesn't have to do with any kind of a deadline. It can be something that doesn't have to do with fiber, like coloring, or something useful and creative, like finally hemming my teaching apron, or something that stretches my fiber skills, like working on spinning beehives. I will do it for 5 minutes or 50, it just depends on the day. I worked hard this year and I want to give myself this little gift to say thanks and recharge. I'm excited, and of course pilling up things to do. Before the bustle of US Thanksgiving starts I want to take a minutre to say, "Thank you!". I am so grateful for all of the people who make it possible for me to keep doing this job I love. Every year it gets better. 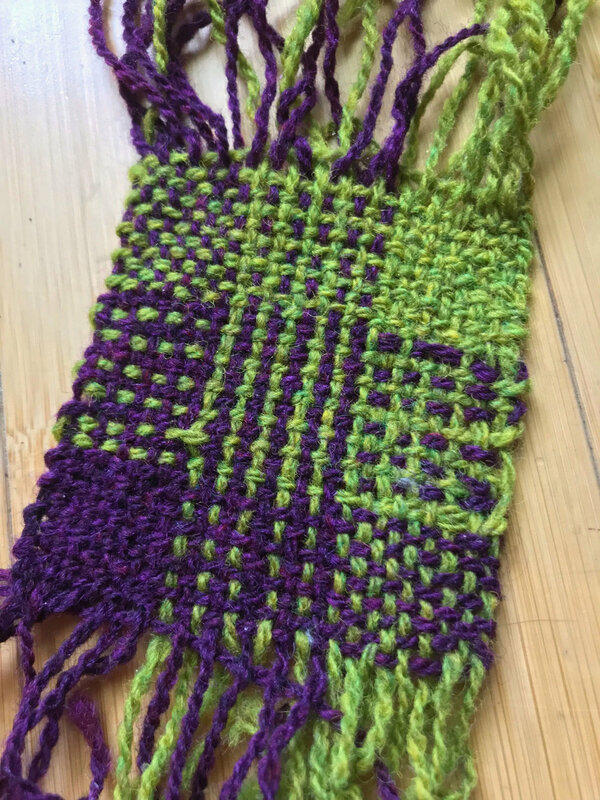 The folks at Knitty and PLY, the spinners and knitters who take my classes, buy my book, hire me to write books and articles, invite me to teach, read my blog and newsletter, all of you allow me to spin and knit and weave as a job. The people who are closer get an extra thanks becasue once in a while (or very often) I need to be told, "You can do it" or be coaxed out from under the couch with treats. Thank you! It's becasue of all of you standing behind me that when a smug someone says, "You can make a living doing that? ", I get to answer with a giant dimples a-blazing smile, "Yes!". I'm just back from teching at the wonderful Magical Fiber Fantasy Retreat, put on by Amy and Scott (yes he wore his kilt) of Ross Farms. I was the sole spinning teacher surrounded by knitterati, Kirsten Kapur, Tanis Gray, and Alana Dakos. There was an amazing marketplace full of yarn and fiber, put on by the LYS Four Purls. My students were some of the most curious I've ever had, and you know I love to answer questions. They spun up a storm, and one even bought herself a new wheel from Four Purls. Of course, I didn't take pictures. There wasn't enough time go into any of the parks (I should have planned better), but a group of us did a bit of shopping at Disney Springs. How does anyone choose from all of the pins they have there? One of my favorite bits about this trip is that it was snowing at home, and I was looking at palm trees in 80 degree weather. That was my last teaching trip until January 2019. It's time for me to wind down, be festive with family and friends, review 2018 and plan for 2019. I'm going to do a lot of crafting in the next few weeks, I can't wait. For those of you wanting an Isobel update, she passed all of her kidney stones, but Cystzilla isn't shrinking and may be growing. She has an appointment right after Thanksgiving and I'll be going along. Thank you again for all of your good thorughts for her. Sometimes you drive to North Carolina excited to teach at SAFF, with a car full of fiber and a shopping list buring hole in your pocket. You spend part of a day setting your classroom up, and then head to downtown Asheville to prowl around. Then a call comes that throws a proverbial monkey wrench into the works. My daughter, Isobel called earlier in the day to say she thought she had kidney stones and was at the hospital. That made me twitchy, but I didn't consider it an emergency. Then she called crying saying they found a cyst the size of a softball on her ovary and were considering emergency surgery. That is an emergency. I rushed back to my classroom and packed it. Thank goodness Beth was driving! I told the wonderful folks at SAFF what was going on, and their universal answer was "Go! We'll figure it out". I went, and it was one of the longest drives of my life. They didn't do surgery, but the doctors are not ruling it out. For now her doctor is trying to shrink the cyst with drugs. I was so grateful I could be here for the doctor appointments and to take care of her. Isobel is uncomfortable and is in some pain (she does have kidney stones too), but it's the waiting that's the hardest, especially since she can't dive or train until the cyst shrinks. Thank you to everyone at SAFF, and to my students for understanding. Thank you to everyone who reached out to me to share their cyst story or send love. I am still more than a little smitten with the idea of making a Savage Hart-Savage Heart. Part of me wants to wait for the most perfect project in the world (to be named at a later time) to use the Corriedale roving I talked about last week. There is a louder, bossier voice that is saying what's more perfect than a Savage Hart-Savage Heart. Savage Heart Cardigan by Amy Christoffers, photos by Amy Christoffers. For those of you just tuning into my brain argument about spinning, I bought 2 lbs of Corrie lamb roving from Savage Hart Farm when I was in Vermont. That's a pretty rare thing, to stumble on. I have also been circling Amy Christoffers Savage Heart Cardigan. Putting the two together seems like a perfect pairing, no? I did a quick sample, on my Flatiron, draftng the roving woolen, but not long draw. I relaxed into the spin, letting it be inconsistent and enjoying the hell out of the delicious and perfect prep and fiber. It is even preitter spun, it goes from lookng mostly brown in the roving to deep mysterious brown with charcoal undertones in the yarn. I knit my bit of yarn, and it's spot on the gauge of the sweater. I knit the swatch using needles bigger than I would if I had spun the yarn from top or if it was a commercial yarn. Why? It had incredible spring, and sponginess. It's the magical combination of roving plus woolen draft. It makes a yarn with enough air, and Corriedale is a breed with enough character, that the yarn works at a variety of gauges. I'm off to SAFF (actually I'm there right now), and then I go to Florida to teach at the Magical Fiber Retreat. I have a few weeks to mull it all over, to study the pattern, and to plan my next samples. I promised you a post on the fiber I bought at Vermont Sheep & Wool, get ready for fiber lust. I shopped at two booths and am thrilled and itchy-fingered by what I bought. The first day I taught, another teacher was sharing the space with me. She taught spinning cashmere and raised cashmere goats. The moment I touched her samples, I knew I would open my wallet in her booth. I did. I bought 2 oz of 100% cashmere (on the right) and 2 ounces of a cashmere/silk blend (on the left). The farm is Boreas Farm Cashmere from Newark, Vermont. She doesn’t have a website. These are earmarked to become something for my husband. My man has developed a wool allergy, wool around his head or face makes him congested, so cashmere it is for him. I went to the Savage Hart booth to look (and probably buy) yarn. I love Amy Christoffers’ Savage Heart Cardigan that she knit out of Savage Hart Cormo yarn. When I got to Peggy’s booth I found out she raises Corriedales and she had a big bag of lamb roving….you know what happened. I asked for two pounds and one of my students, Vicki (hi!) who was speed shopping with me, got the other two pounds. Look at it! I may have done a little dance around it in the booth. This may well become a Savage Hart Savage-Heart Meta Cardigan this winter. I am not going to Rhinebeck this year, please hug each other for me!